When you want to satisfy your sweet tooth, don’t forget to consider using maple syrup which contains fewer calories and a high concentration of mineral than honey. 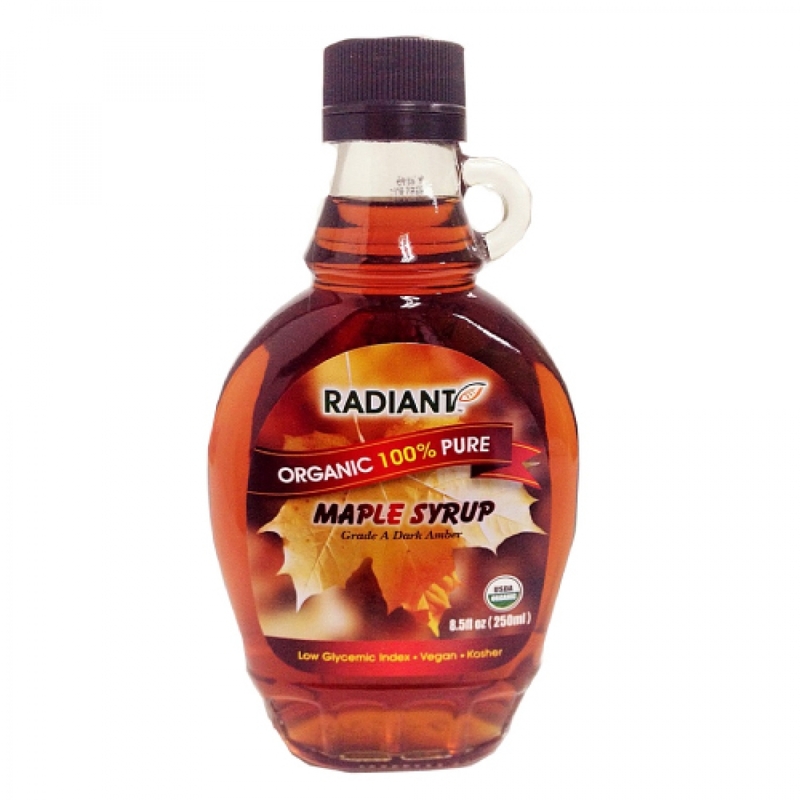 Radiant Organic Maple Syrup is extracted from the sweet sap of maple tree (Grade A medium). By Organic Standards, the trees are not over tapped to keep the tree in better health. The maple saps are stored in stainless steel drums and formaldehyde or other chemicals are prohibited in the processing. It is pure maple syrup. No corn added. Maple syrup is one of the many wonders of the world. This viscous amber liquid with its characteristics earthy sweet taste is made from the sap of the sugar, black or red maple tree. Maple syrup is sweet - and we're not just talking flavour. Maple syrup, as an excellent source of manganese and a good source of zinc, can also be sweet for your health. The trace mineral manganese is an essential cofactor in a number of enzymes important in energy production and antioxidant defences. The zinc supplied by maple syrup, in addition to acting as an antioxidant, has other functions that can decrease the progression of atherosclerosis. Add maple syrup and cinnamon to pureed cooked sweet potatoes. Combine maple syrup with orange juice and tamari and use as a marinade for baked tofu or tempeh. Spread peanut butter on a piece of whole wheat toast, top with sliced bananas and then drizzle maple syrup on top for sweet, gooey treat.